We awoke to a FREEZING cold room. The coal had burned out during the night and the room was now frozen, literally. We could clearly see our breath and our water bottles were frozen solid. After a half an hour of psyching ourselves up, we quickly changed clothes and headed over for breakfast. We ate 2 giant bowls of rice porridge (or congee) accompanied by honking pieces of fresh bread that looked like a giant bagel and tasted a bit like sourdough. Since we weren't able to visit the Thangka artists, we decided to head to town and visit the temple there and then to another monastery with the tallest stupa in Amdo (a region of Tibet that doesn't follow China's border distinctions) on the way back. At the main gate, we hitched a ride into Tongren. The town was already bustling, the streets lined with various vendors selling everything from Tibetan fabrics, animal hides and fireworks to DVDs, fruit, prayer flags, and whole cows. We headed towards the Longwu Monastery at the edge of town, near the Xishan Mountains. This Gelukpa or Yellow Hat monastery was built in 1301, but has been destroyed, rebuilt and expanded many times throughout its 700 year history. The walls are lined with prayer wheels that people constantly spin as they walk the kora or path around the exterior of the monastery. 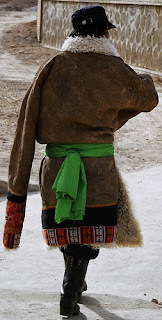 Dan and I walked in silence, watching Tibetans wrapped in traditional garments praying throughout the various halls and temples. We felt a bit out of place to say the least. We could never quite tell where we were allowed to go or if we were disturbing their rituals. It was beautiful, but we weren't exactly sure what we were looking at. After the monastery we decided to stop for lunch. We squeezed into a tiny restaurant that only serves MoMo, Tibetan style dumplings served in a clear broth. Dan ordered and then we waited. I figured these must be good dumplings for everyone to sit quietly for about 20 minutes as traditional Tibetan music blared over the speakers. At least it gave us plenty of time to people watch and for people to watch us. a third bag of crunchy snacks to munch on as he waited for his dumplings. A man at the adjacent table pulled a mobile phone, man-purse and his own bag of cookies out of his pouch. I'ma have to get one of these snack pouches for myself! Our bellies full and warm, we took a car about 10 minutes to Gomar Gompa, a 400 year-old fort that also houses the largest stupa in all of Amdo. Even though there weren't many people around, we happened to meet a young Tibetan monk willing to show us around a bit and explain some of the paintings/stupas. We climbed to the top of the stupa which reaches about 36 meters in height. In order to get to the top, we had to climb small, narrow steps and then walk clockwise, about half-way around each level of the stupa to the next staircase. There were no guardrails, no fences, and no railings to hold on to. As we climbed further up, I started walking slower and slower. In order to keep my hand against the wall of the stupa, I had to crouch and sort of waddle around each corner. The monk started to notice and asked Dan what was wrong with me. He explained that I'm horribly afraid of heights, but just let me be and I'll eventually make it to the top. I did make it to the top and was rewarded with a golden Buddha surrounded by beautiful Thangka art and actual clothing that was once worn by the 10th Panchen Lama. We asked about the meaning of various imagery in the paintings, but found the monk couldn't really tell us. He kept reassuring us that it was indeed Thangka art and for us, that's all that really matters. We asked the monk about the 10th Panchen Lama and were told that the Tibetans aren't really sure where he is or if he's still alive since he's been incarcerated by the Chinese government. Enough said. We chatted a bit longer about where we're from and what we do. Dan explained that he was a tour guide and I make cakes and desserts. The monk broke into a wide smile and said, "Ohhh!! KFC cook! Chicken burgers!" Dan tried to correct him, but there was no use. I'm not sure why he thought of KFC, since neither of us mentioned fried chicken. We slowly made our way down, the monk behind me, holding the back of my jacket telling me not to be afraid. Maybe now I won't be scared of heights anymore. I've tried everything else to overcome this fear, but nothing as great as a monk's touch – it has to work! He took us to another small temple and called out to inform his friend, quite proudly, that the, "KFC cook-lady has come to see our temple." Since it was almost dark, we walked the 15 minutes back to Wutun. Along the way we crossed a bridge and noticed women chopping huge chunks of ice from the frozen river. They then tied these huge pieces of ice onto their backs and hauled them up the hill to the road. We asked Grandpa if they were for drinking water and he said yes. The next morning we saw chunks of ice outside every door in the village. We asked if they were waiting for them to melt so they can drink them. He said no. A bit confused, we asked for an explanation. He told us it's the 8th and every 8th Tibetans put ice outside their door. We asked why and he reaffirmed that it's the 8th. What about this did we not understand? We decided not to push any further, nor point out the fact that today's date was actually the 10th. It seems as though no one can really explain what we've been witnessing. clockwise around the monastery 3 times while spinning these wheels and chanting. Once again we crowded around the stove with the family and stuffed ourselves with rice and stir-fried potatoes with green onions and chunks of beef. Over dinner we asked again about seeing the artists. "Oh, yeah. Tomorrow I think you won't be able to visit until after 3." What?! We asked why and no one could really tell us. No problem, we could sleep in and spend the afternoon watching them paint. Excited about finally seeing the Thangka artists, we headed to bed early.